This is the first chapter in the Little Black Book of Scams. Become a real-life superhero by arming yourself with the information you need to fight fraud and keep yourself, your family and your money safe. You work hard for your money. You want to spend it on things that matter to you - whether it’s your children’s education, an exciting trip or a new phone. Fraudsters are real. They are out there everyday looking for victims. They will target you online, over the phone, by mail or in person. You’re a target. Thousands of New Zealanders lose millions of dollars to fraudsters every year. The impact of fraud on families and businesses can be devastating. Learn to fight fraud. Over the next few days, we will be re-posting a chapter a day from a booklet published by the Commission for Financial Capability, or the CFFC. 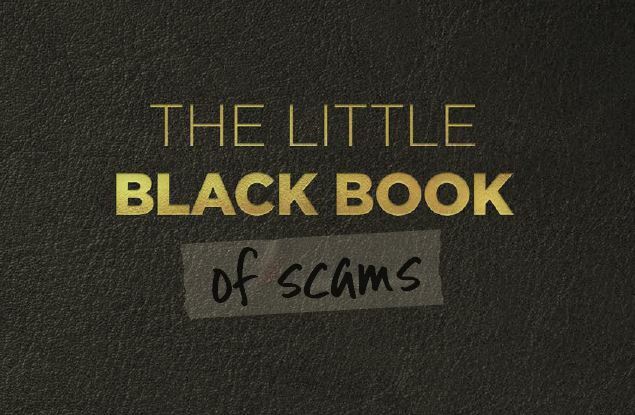 This booklet highlights 11 of the most common scams currently targeting New Zealanders. It is filled with tips and tricks on how to protect yourself and what to do if you do get scammed. Anyone can be targeted, from teenagers, to grandparents, to senior corporate officers. The best thing you can do is to report the fraud, whatever the amount, to the appropriate authorities. Don’t be embarrassed as it will help others from falling for it. *The full booklet is here. This chapter is re-posted with permission. You can also watch a video interview with the Commission for Financial Capability's fraud education manager Bronwyn Groot here. No mention of Property investment seminars? What might be helpful is if we had some proper laws about data security with an onus on heavy fines and liability falling on directors. It wouldn't be half as difficult to avoid scams if we didn't risk our data being stolen every time we ordered a pizza for example.